The blog about verbs and verb conjugation. There was a spelling reform in the German language in 1996. Among other changes, the ortography underwent a change, where ‘ß’ sometimes started to be written as ‘ss’. and elsewhere it’s substituted by ‘ss’. A good sample verb is essen ‘to eat’. In present the preceding vowel is short and therefore written ‘ss’. In past the vowel is long and therefore written ‘ß’. Verbix supports both ways of writing German, check the link below to see more. Essen ‘to eat’ verb conjugated before spelling reform. Essen ‘to eat’ verb conjugated after spelling reform. Today I read about Hungarian language and its verbs. Just like Finnish, a very remote “sister” language, the Hungarian has only a few irregular verbs. In fact the number of irregular languages is 23. The 23 irregular verbs are now listed on Verbix website’s Hungarian verb conjugator page. Today I took the opportunity to visit one of the public libraries in Espoo. Although there’s a great number of language related sites and pages in the Internet, the language books are still the primary source of information when it comes to grammar and language details. You soy, tú eres, él es, … now on the Windows Phone! Yes, Verbix is now available for Windows Phone. 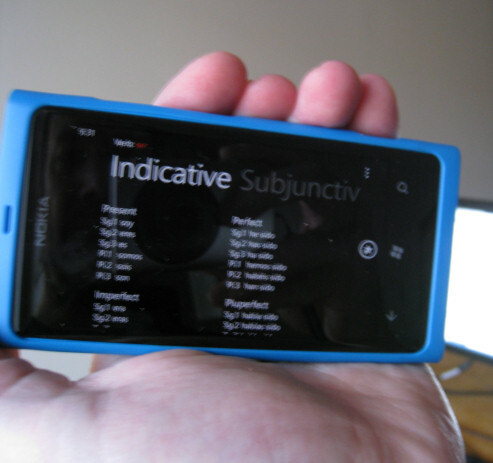 This totally new version of Verbix is able to conjugate any Spanish verb on a Windows Phone (7 or 8). The Spanish verb “ser” on Windows Phone. It’s faster, it’s even faster than on my PC. Store favorite verbs. So instead of typing over and over the same verb, simply tap it and your done. As you type, the verb list of 11,000+ verbs scrolls. You seldom need to type the whole verb. The verb tables were designed to fit as well as possible on the screen. So instead of using Verbix in the web, you no more need to zoom/zoom-out. Windows Phone Marketplace (find “Verbix” there). An extinct language is a language that no longer has any speakers. The speakers switch to another language. The language evolves so much that it’s considered a different language. Among the extinct or nearly extinct languages, the users of Verbix can conjugate Latin and Gothic verbs. In WikiVerb there’s now also a page dedicated to extinct languages. The Japanese language was added a month ago to the supported languages of the Verbix verb conjugator. Currently Verbix allows users to enter the verbs to conjugate in letters of the English alphabet. This is achieved by supporting romaji, i.e., writing the letters in Latin script. This is also called romanization. There are several romanization systems, from which Verbix chose Hepburn romanization with minor modifications. Hepburn is the most common romanization system in use today, especially in the English-speaking world. Japanese verb conjugation is quite simple, because most verbs are regular. The regular verbs are divided in Ichidan and Godan verbs. Ichidan verbs end in -eru and -iru. The Godan verbs end in a consonant or vowel and -u.
Suru is one of the most used verbs in Japanese, because it is used to form compound verbs, such as benkyousuru （勉強する）’to study’ and dansusuru （ダンスする）’to dance’. From the latter example you can see that suru is used to make new verbs from loan words, too. While the verb conjugation itself is easy, the use of the verbs is not. But that’s another story. Last Sunday there was president elections in Finland. The Finnish verb for vote is äänestää. This verb wasn’t in the Verbix database, so it was added yesterday along with a number of other verbs. Although the verb wasn’t included in the Verbix database, the on-line conjugator conjugated the verb correctly. Just the warning was a bit annoying for this common verb. Another verb that wasn’t there in the database until yesterday was ystävystyä ‘to become a friend’. This verb will probably remind about itself on 14.2. that is called ystävänpäivä ‘Valentine’s Day’ in Finland. Swedish language is a Germanic language that is spoken in Sweden and in Finland. In Finland, the Swedish language is the second official language. Swedish is spoken on coastal areas in Finland. There are four main variants of the Swedish in Finland as shown on the map. The spoken variations differ quite a lot from each other, but as a written language they are all the same. The written language is the same in Finland and in Sweden. How to Use the Spanish Verb Conjugation Book? There’s an “Easter Egg” in Verbix 9 for Windows. An Easter Egg in software is a hidden feature that is not documented. In Verbix 9 the hidden feature creates a Spanish Verb Conjugation book and saves it as PDF. This article describes how to use the book. As a matter of fact, this book is used exactly in the same way as any verb conjugation book that you can buy in a bookstore! 1. First look up the verb from the verb index. As in many verb conjugation books, the Spanish Verb Conjugation book created in Verbix for Windows 9.0 has an index of verbs. Let’s find for example ‘ser’ (English ‘to be’). 2. Check the verb model that the verb refers to. In the index the verb ‘ser’ is marked with number 1. This number refers to the verb conjugation table 1. Now that we browse the book to verb conjugation table 1, we find the verb ser conjugated in all tenses. As in Verbix, irregular forms are displayed in red and regular forms are in black. The book has an index of 38,395 verbs. The book comprises 231 pages. Posted on January 13, 2012 January 13, 2012 Categories Language, SoftwareTags conjugation, Spanish, Verb1 Comment on How to Use the Spanish Verb Conjugation Book?